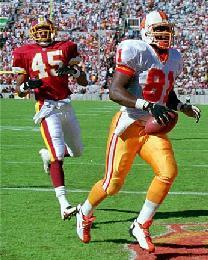 In spite of all the receivers who wore this number for the Buccaneers, it is a tight end who takes our best-ever award. 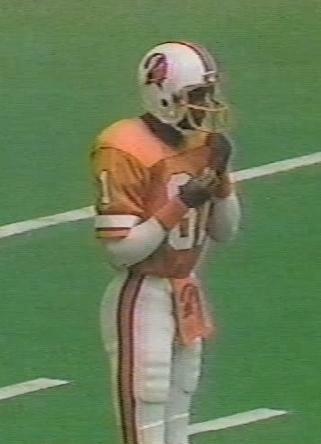 Jackie Harris had three solid years in the 81 jersey having arrived in Tampa as a free agent from Green Bay. But then apart from Phil Freeman's brief moments as a kick returner and occasional receiver, the lack of performance from this number has been startling. 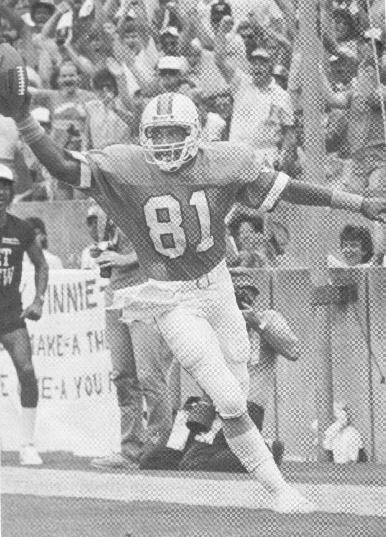 Stephen Starring was a waste of a third-round trade, and Perry Tuttle was an even-bigger bust as a 1st round pick in Buffalo before playing a handful of games in 1984 for the Bucs. Isaac Hagins will be remembered by some of the early fans of the franchise catching balls from Doug Williams, and more recent fans will remember the likes of Jacquez Green and Charles Lee. Alex Smith opened his Buccaneer career with a pair of touchdowns in Minnesota and then flattered to deceive from then on so came close to defeating Jackie Harris but not close enough. Micheal Spurlock switched to this number from his kick return jersey of 17 and Tim Wright was a nice rookie surprise in 2013 but neither did enough to threaten the jersey award.